I was a writer of challenging young adult fiction when my editor at Walker, the late great Wendy Boase, asked me to have a go at writing a picture book. I happened to have a doodle of a man in a helicopter hat with three rabbits on leads. I wrote a story based on this. It didn't work, so we cut two of the rabbits and the man in the hat. That was the beginning of “Daley B”. Wendy had given me a few picture books to look at. One of them had stupid questions in it, such as “Did the dog sit on the ball? Did the ball sit on the dog?” That gave me the idea for the questions asked by Daley B. I can't remember how the story evolved, but once I'd created a character as innocent and confused as Daley B, it was probably obvious I had to put him in a situation of grave danger. But it was only after Walker had accepted the text that we decided what should happen when Jazzy D leapt at Daley B. I then rewrote the story to make Daley B's big feet a central interest. I'm sure the joke at the end occurred to me only after I'd written the line “You're a hero, Daley B!” As I never tire of telling my creative writing students, you can never plan all that takes place in a story: things happen spontaneously in the act of writing which lead to the final vision of what the story should be – even in a picture book. The first illustrator lined up for “Daley B” couldn't do the book. Wendy and Jim the art editor then proposed an unknown young illustrator who they thought might do a good job. His name was Axel Scheffler. Axel's illustrations, with all their wit and innocence, turned out to be the perfect match for the story. “Daley B”, or “You're a Hero Daley B” as it became in the paperback version, is my most successful book, and though I still like to be known for my more grown-up fiction, such as “The Last Free Cat”, I am extremely proud of it. It's very much me – I like to think no-one else could have possibly written it. It's also a memorial to Wendy, who was such a great mentor to me, and whose sharp editorial eye was so vital to its success. Can you draw yourself waterskiing like Daley B? Have a go at this fun activity sheet! You're a Hero, Daley B! 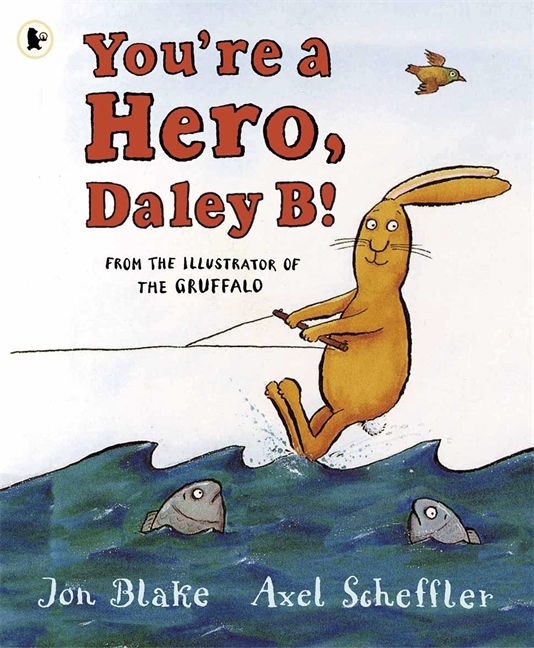 by Jon Blake and Axel Scheffler is available to buy here. You're a Hero - picture book competition!